UPDATE: Trump always has to get the last word. Since Nieto canceled the meeting this morning, Trump is threatening 20 % tariff on Mexican imports. This of course would mean higher prices for consumers. Mexico is America's second largest customer for the export of our goods. If they imposed a tariff on us in retaliation, which can be expected, once again it would be American citizens who suffer for it. "Mexico offers and demands respect, as the fully sovereign Nation we are." said Mexican President, Pena Nieto on Twitter last night. To reinforce his statement, this morning he cancelled a meeting with Trump that was scheduled for next Tuesday. Like many Americans, Nieto is pushing back at Trump's heavy handed, inept, attempts to force everyone to support his dystopian view of America as well as swallow his misinformation on immigrants and crime. Trump must have thought that being a jackass aka "politically incorrect" would work in international relations. Apparantly not. 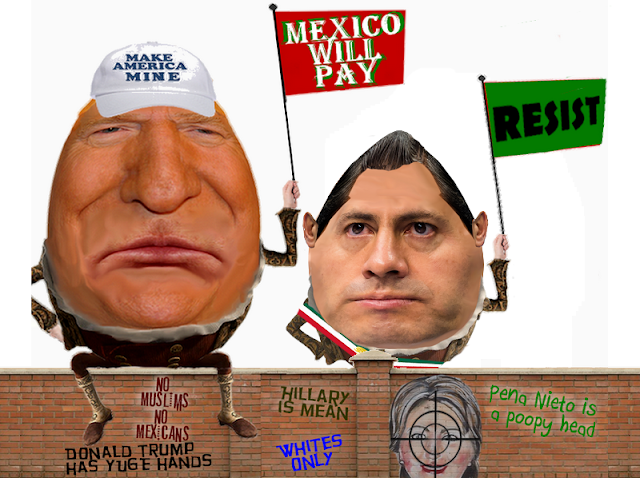 Nieto clearly stated last year that Mexico would not pay for the wall and he hasn't changed his mind. But naturally, after Nieto informed the White House that he would not be attending the meeting, Trump tweeted "If Mexico is unwilling to pay for the badly needed wall, then it would be better to cancel the upcoming meeting." Gracias Presidente Nieto. ¡America te saluda! This morning we informed the White House that I will not attend the scheduled work meeting for next Tuesday with @POTUS. Mexico reiterates its willingness to work with the United States to reach agreements on behalf of both nations. I regret and reject the US decision to continue building a wall that far from uniting us, divides us. ... I will make the decision on the next steps to be taken in our bilateral agenda. Mexico offers and demands respect, as the fully sovereign Nation we are. We reaffirm our friendship with the people of the United States. And our willingness to reach agreements with its government. Agreements in favor of Mexicans.